Adelaide Duo / Band 448 is amongst Adelaide’s most exciting and experienced cover bands, performing a wide variety of popular spanning 6 decades. Our extensive repertoire covers a variety of genres from some of rock, pop and jazz’s most prolific artists. Whether it’s the classic hits from The Beatles, Abba, Queen or Van Morrison, to more recent crowd pleasers such as Michael Bublè, Pink, Bruno Mars or Maroon 5, Adelaide Band 448’s wide repertoire makes us the perfect choice to cater for a broad audience at any function. 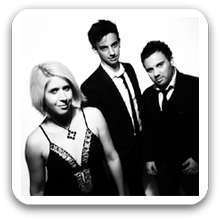 Adelaide Duo / Band 448 specialises in Weddings, Corporate Events and Private Functions. We work closely with our clients in detailing all aspects of the event, to ensure they receive the great entertainment their special occasion deserves. Combining an exciting stage presence with great musicianship and a fantastic blend of harmonies, Adelaide Duo / Band 448 is a multi-faceted ensemble comprising of 3 talented and seasoned musicians. Adelaide Band 448 is also available in a duo format or expanded to include a drummer. Can perform as a: Duo, 3 and 4 Piece Band and are available to perform in Adelaide and Surrounding Areas. Wow!! What a great band with excellent variety, was a pleasure to have you perform at our venue.